Warm, flexible and soft to the touch, the Golden State Warriors Nike Dri-FIT Showtime Women's NBA Hoodie keeps you in the comfort zone on or off the court. It's inspired by the authentic, on-court warm-up hoodie. 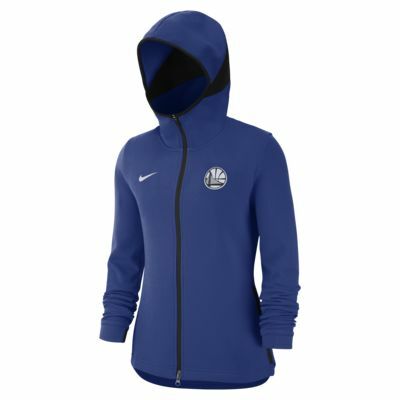 Warm, flexible and soft to the touch, the Golden State Warriors Nike Dri-FIT Showtime Women&apos;s NBA Hoodie keeps you in the comfort zone on or off the court. It&apos;s inspired by the authentic, on-court warm-up hoodie. Fabric: Body: 78% polyester/22% cotton. Face of hood center back panel: 100% polyester. Back of hood center back panel: 65% cotton/35% polyester. Hood lining: 78% polyester/22% cotton. Have your say. Be the first to review the Golden State Warriors Nike Dri-FIT Showtime.